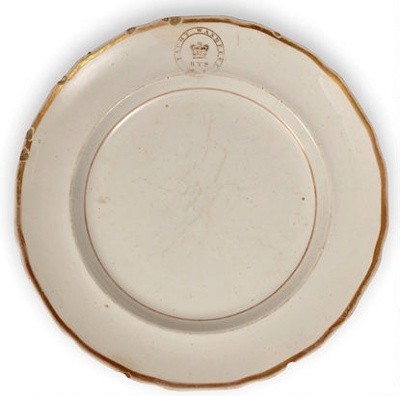 This round porcelain entrée plate featuring gold edging and transfer badge is from the schooner Wanderer, wrecked whilst attempting to enter Port Macquarie after suffering damage during a severe gale in November 1851. The Wanderer owned by Scotsman Ben Boyd was once a unit of the Royal Yacht Squadron and its fine appointment and luxurious fittings were enjoyed by members of the British Royal family before the yacht sailed to Australia in 1842. Boyd arrived in Australia with grand business ambitions matching his opulent yacht, and for a time found great success however his less than straight forward business practices and financing arrangements resulted in his financial demise in the late 1840s. Like many others Boyd then tried his fortunes in the Californian gold fields and this too failed. His attempts to establish business in the Pacific Islands resulted in his death; reportedly murdered by natives. Following the loss of its captain the Wanderer was sailing back to Sydney when it struck bad weather and was subsequently wrecked. Local reports suggest that the Wanderer attempted to enter the Hastings River despite advice not to do so and speculation remains about why the crew decided to make the fateful attempt. The Wanderer is one of several ships wrecked at the Port Macquarie entrance between 1821 and 1879. The plate with the Wanderer’s badge represents Boyd’s bold ambitions and rich lifestyle which contributed to his demise and ultimately that of his ship. Boyd is remembered as a failed entrepreneur who at one time or another was also a shipping magnate, merchant, banker, pastoralist and station owner, Member of the Legislative Council, town planner and whaler. The plate is a rare surviving item from Ben Boyd’s grand but ill fated schooner and illustrates the practice of badging ship crockery. It evidences the type and style of crockery commissioned by Boyd for his luxurious ship and leaves us to imagine the plate in use at lavish dinner parties on board the Wanderer attended by the British Royal family and Sydney gentry during the 1840s.